The team found themselves discovering and exploring crop circle formations that would have profound implications on the progression of this unfolding mystery. Many people involved in crop circle research were interviewed on our journey. They described their own extraordinary experiences. The twist and turns of the season took the team to surprising locations, many with a backdrop of breathtaking scenery. 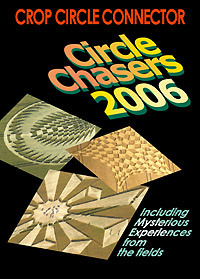 This DVD incorporates evocative music, and of course the amazing imagery of the crop circles within their landscape. The power and presence of these incredible events can not be under estimated, as we provide our own vision of this phenomenon. Our 5th production on this ever expanding phenomenon, will complement the DVDs from previous years, as we delve deeper into the mysteries of their meaning, and their placement within the landscape. The Kent Phenomenon. Andy Fowlds discusses the Kent circles and the strange sightings surrounding their formations in recent years. The Interaction Effect - Simeon Hein takes us through the 2006 formation at Woodborough Hill, commissioned by the world famous "Human Calculator" Scott Flansburg. Simeon also discusses the unusual anomalies that were recorded at the site.